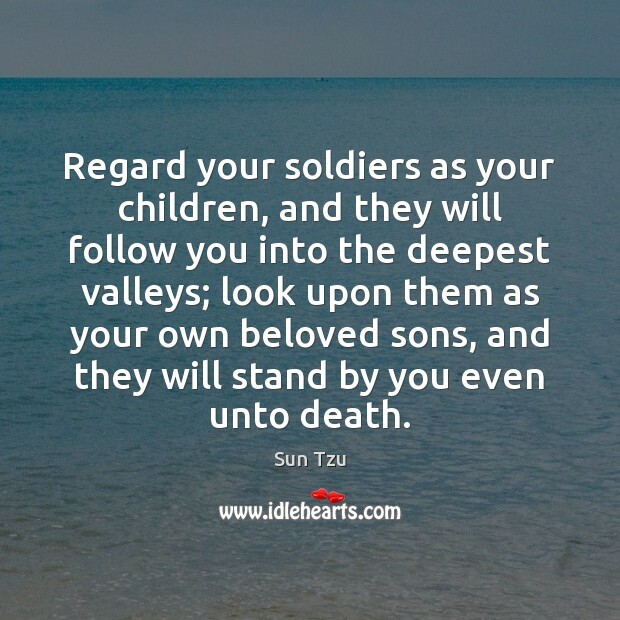 Quotations about Beloved Son. Quotes to stimulate mind and drive action! Use the words and quote images to feed your brain inspiring things daily! 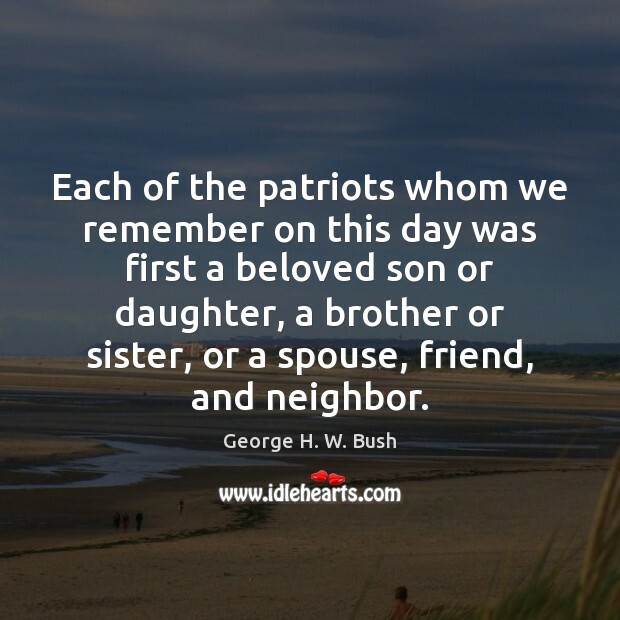 Each of the patriots whom we remember on this day was first a beloved son or daughter, a brother or sister, or a spouse, friend, and neighbor. 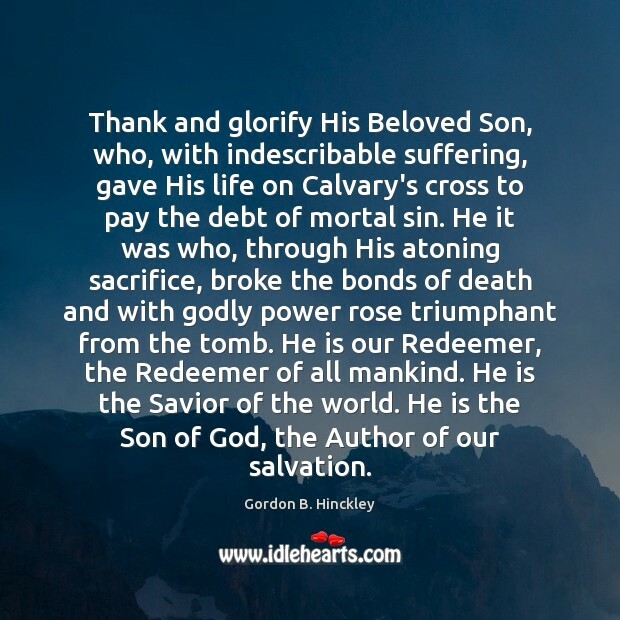 Thank and glorify His Beloved Son, who, with indescribable suffering, gave His life on Calvary's cross to pay the debt of mortal sin. He it was who, through His atoning sacrifice, broke the bonds of death and with godly power rose triumphant from the tomb. 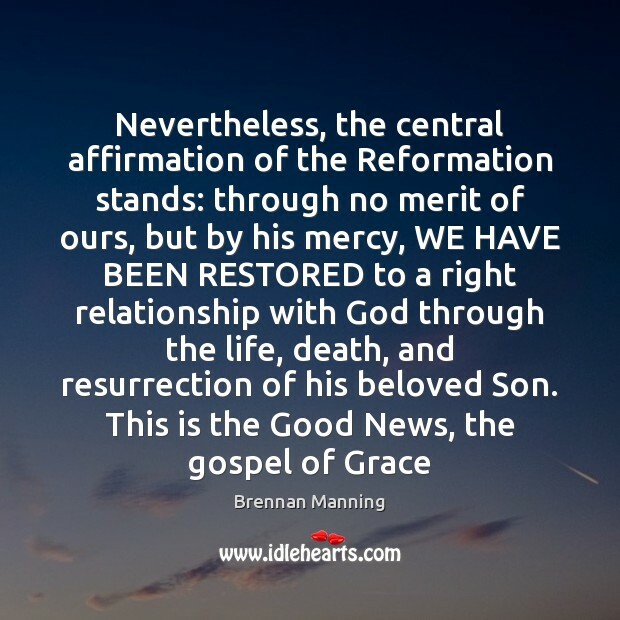 He is our Redeemer, the Redeemer of all mankind. He is the Savior of the world. He is the Son of God, the Author of our salvation. The Father to whom we pray is the glorious God who created worlds through His Beloved Son. The power of procreation is spiritually significant. Misuse of this power subverts the purposes of the Father's plan and of our mortal existence. Our Heavenly Father and His Beloved Son are creators and have entrusted each of us with a portion of Their creative power. Again, there are other things associated with these matters, all bearing more or less upon the same points. 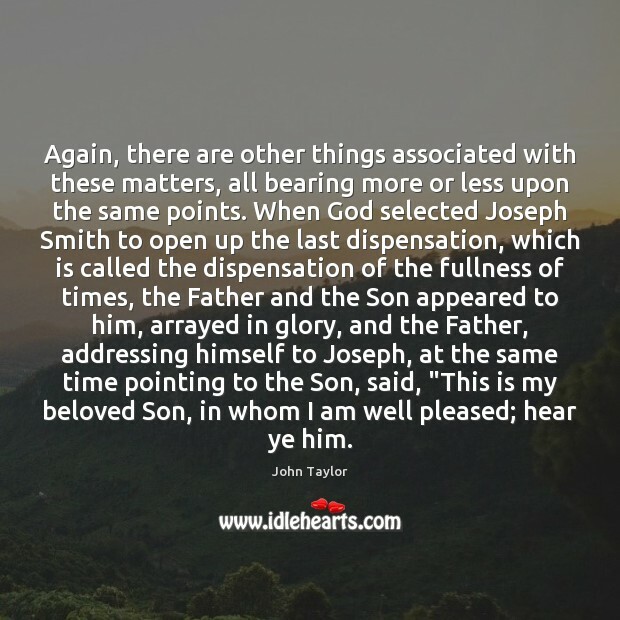 When God selected Joseph Smith to open up the last dispensation, which is called the dispensation of the fullness of times, the Father and the Son appeared to him, arrayed in glory, and the Father, addressing himself to Joseph, at the same time pointing to the Son, said, "This is my beloved Son, in whom I am well pleased; hear ye him. The deeper we grow in the Spirit of Jesus Christ, the poorer we become - the more we realize that everything in life is a gift. The tenor of our lives becomes one of humble and joyful thanksgiving. 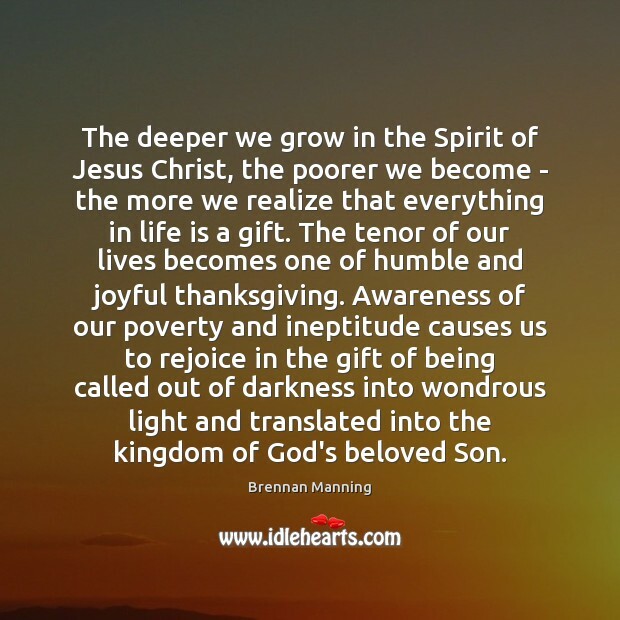 Awareness of our poverty and ineptitude causes us to rejoice in the gift of being called out of darkness into wondrous light and translated into the kingdom of God's beloved Son. 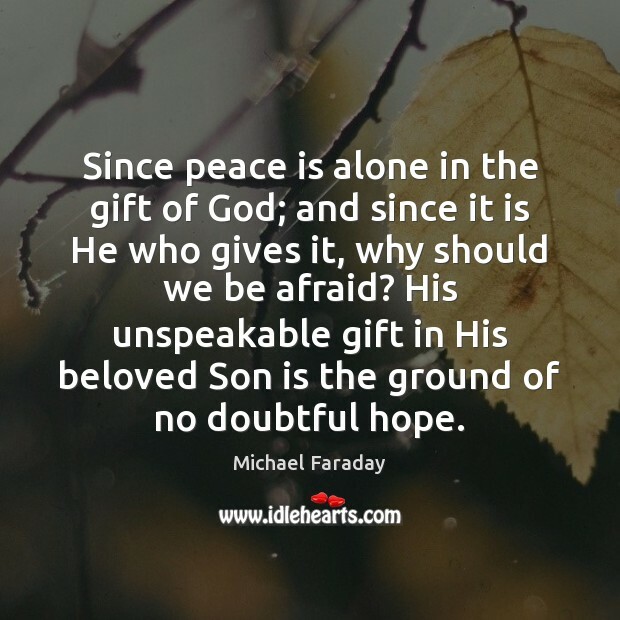 Since peace is alone in the gift of God; and since it is He who gives it, why should we be afraid? His unspeakable gift in His beloved Son is the ground of no doubtful hope. 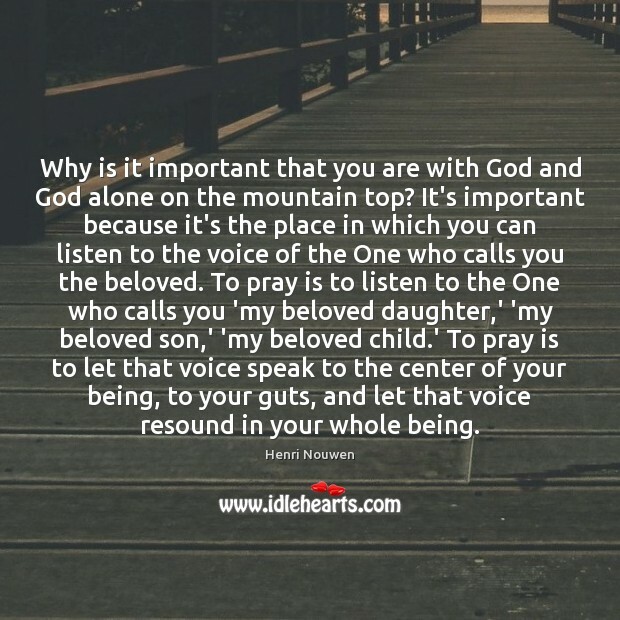 Why is it important that you are with God and God alone on the mountain top? It's important because it's the place in which you can listen to the voice of the One who calls you the beloved. To pray is to listen to the One who calls you 'my beloved daughter,' 'my beloved son,' 'my beloved child.' To pray is to let that voice speak to the center of your being, to your guts, and let that voice resound in your whole being. 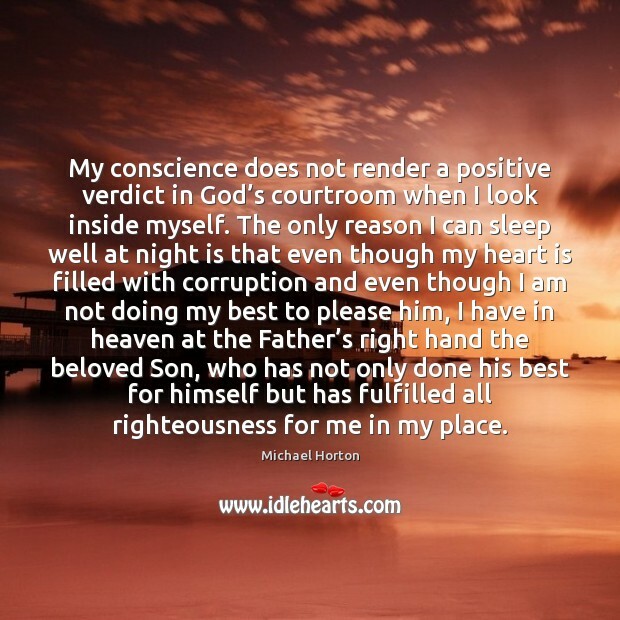 My conscience does not render a positive verdict in God’s courtroom when I look inside myself. The only reason I can sleep well at night is that even though my heart is filled with corruption and even though I am not doing my best to please him, I have in heaven at the Father’s right hand the beloved Son, who has not only done his best for himself but has fulfilled all righteousness for me in my place. 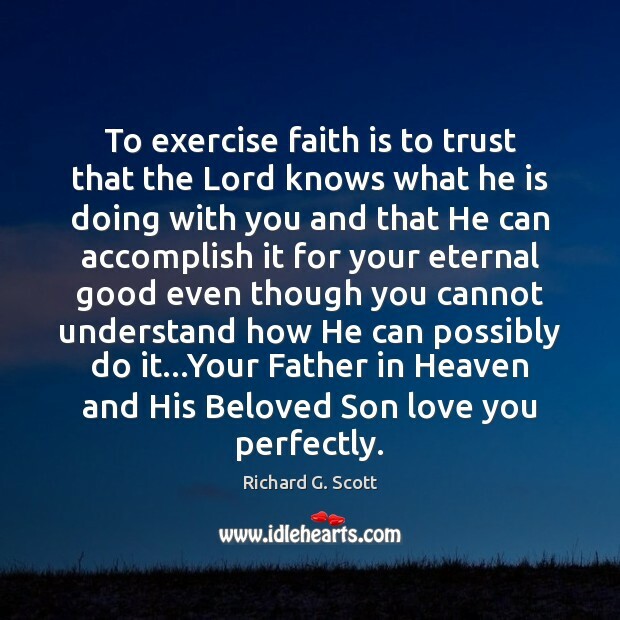 To exercise faith is to trust that the Lord knows what he is doing with you and that He can accomplish it for your eternal good even though you cannot understand how He can possibly do it...Your Father in Heaven and His Beloved Son love you perfectly. 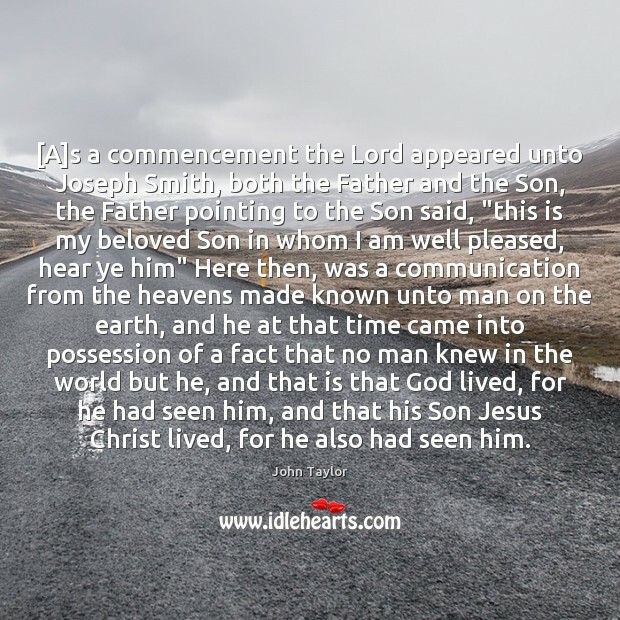 [A]s a commencement the Lord appeared unto Joseph Smith, both the Father and the Son, the Father pointing to the Son said, "this is my beloved Son in whom I am well pleased, hear ye him" Here then, was a communication from the heavens made known unto man on the earth, and he at that time came into possession of a fact that no man knew in the world but he, and that is that God lived, for he had seen him, and that his Son Jesus Christ lived, for he also had seen him. 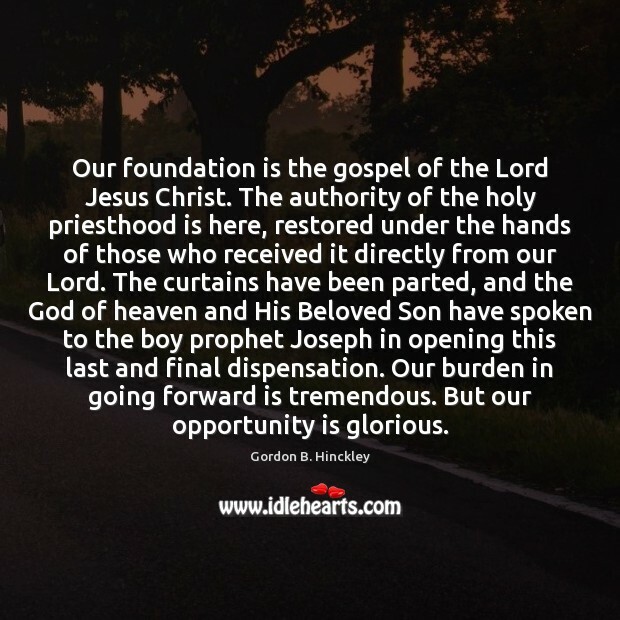 Our foundation is the gospel of the Lord Jesus Christ. 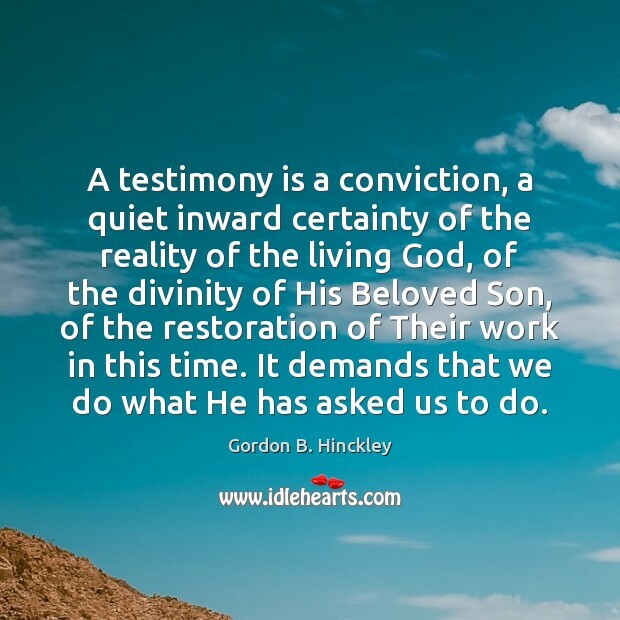 The authority of the holy priesthood is here, restored under the hands of those who received it directly from our Lord. The curtains have been parted, and the God of heaven and His Beloved Son have spoken to the boy prophet Joseph in opening this last and final dispensation. Our burden in going forward is tremendous. But our opportunity is glorious. 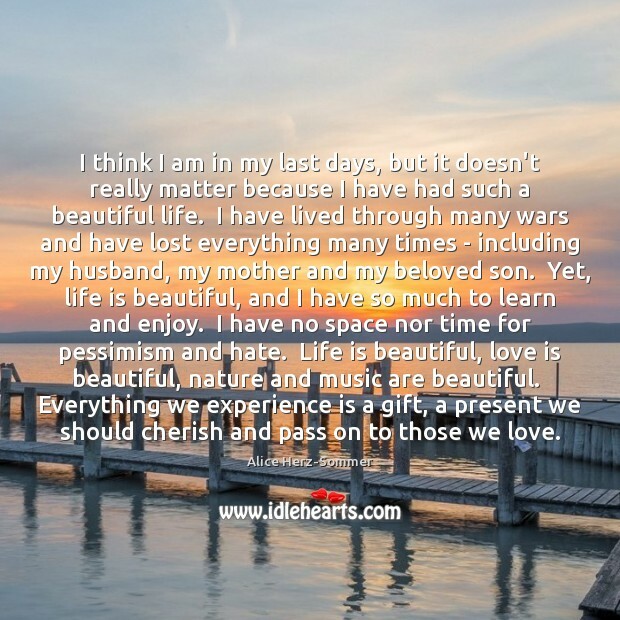 I think I am in my last days, but it doesn't really matter because I have had such a beautiful life. 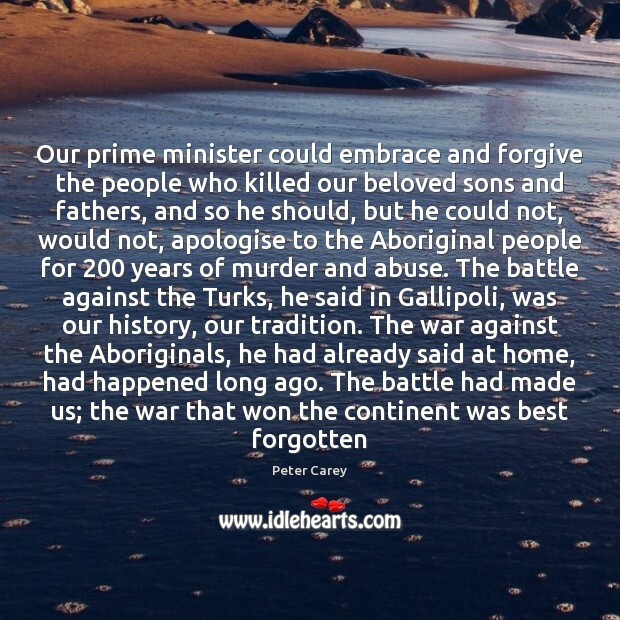 I have lived through many wars and have lost everything many times - including my husband, my mother and my beloved son. Yet, life is beautiful, and I have so much to learn and enjoy. I have no space nor time for pessimism and hate. Life is beautiful, love is beautiful, nature and music are beautiful. Everything we experience is a gift, a present we should cherish and pass on to those we love.